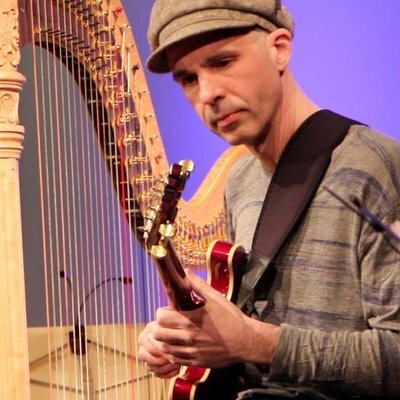 David Occhipinti has released five CDs as a leader that feature his unique voice as a composer and as a guitarist. On David’s release, Camera (2012), he combines elements of contemporary chamber music with improvisation. The recording features David’s compositions and guitar playing, with a unique ensemble, consisting of: clarinet, bassoon, marimba, guitar, violin, viola, cello, and bass. The recording also includes a suite for guitar and string quartet. David has multiple nominations for JUNO awards including his CD Forty Revolutions (2007), and Duologue (2003), his first of two duo CDs with saxophonist Mike Murley. Another collaborative effort called Bristles (2014), whcih David produced and mixed, was also nominated for a JUNO and given four stars in the internationally acclaimed Downbeat magazine. As a composer, David has received numerous commissions to compose for solo artists, chamber groups and large ensembles. His compositions appear on CDs by Beverley Johnston, Random Access Large Ensemble and many others.